The Greek government has announced that an “extremely important” tomb has been found in northern Greece, sparking speculation about who may be buried inside. After touring the Kasta Hill archaeological site with his wife and government officials, Greek Prime Minister Antonis Samaras told reporters, “It is clear that we stand before an extremely important finding.” According to Samaras, since archaeologists began their excavation work in 2012, they have unearthed a massive burial mound ringed by a 1,600-foot-long, 10-foot high circular wall constructed from white marble imported from the nearby island of Thassos. A broad, five-yard-wide road leads to the tomb entrance, which is guarded by two headless sphinxes. Marble decorations and frescoed walls adorn the tomb, which was partially destroyed during the Roman occupation of Greece but apparently has survived without looting for more than 2,000 years. Archaeologists believe the 16-foot-tall marble Lion of Amphipolis, which was discovered a few miles away in the bed of the Strymonas River in 1912, once crowned the massive grave. Lead archaeologist Katerina Peristeri dates the burial tomb to between 325 B.C. 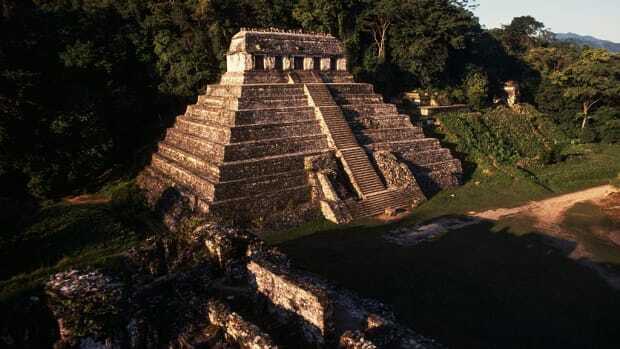 and 300 B.C., in the era at the end of the reign of Alexander the Great, the Macedonian warrior-king who rose from the surrounding land of northeast Greece to establish an ancient empire that touched three continents and stretched from the Danube River to India. “It looks like the tomb of a prominent Macedonian of that era,” an official from the culture ministry told Reuters. 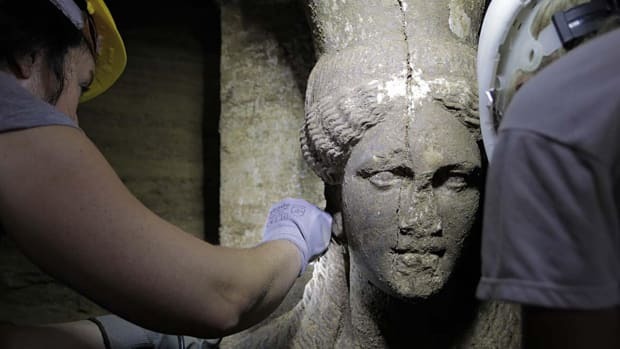 The newly unearthed burial site is believed to be the largest ancient tomb ever discovered in Greece, dwarfing those of Macedonian royals, including Alexander’s father Philip II, buried more than 100 miles west of Amphipolis in the small town of Vergina. Still unanswered is whose tomb it is. “Regarding the key question, the excavation will reveal the identity of the deceased,” Samaras said. 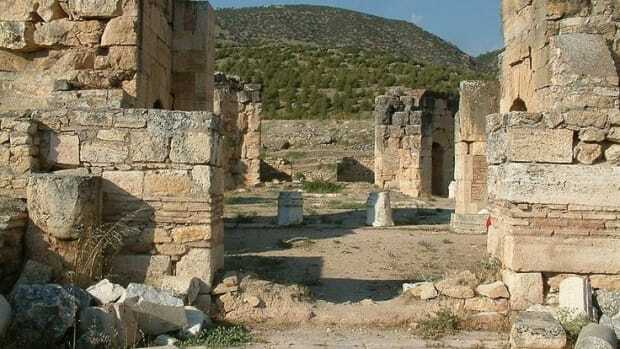 “The tomb is definitely dated to the period following the death of Alexander the Great, but we cannot say who it belongs to,” Peristeri told Agence France-Presse. The tomb is almost certainly not the resting spot of Alexander the Great, who died in Babylon, modern-day Iraq, in 323 B.C. 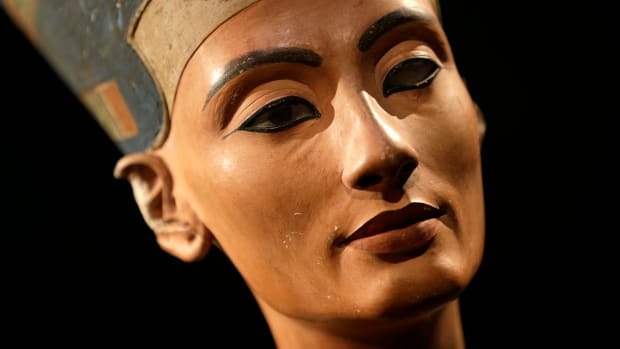 He was believed to have been buried in Egypt after his corpse was stolen en route to his homeland by Ptolemy, one of his former generals. 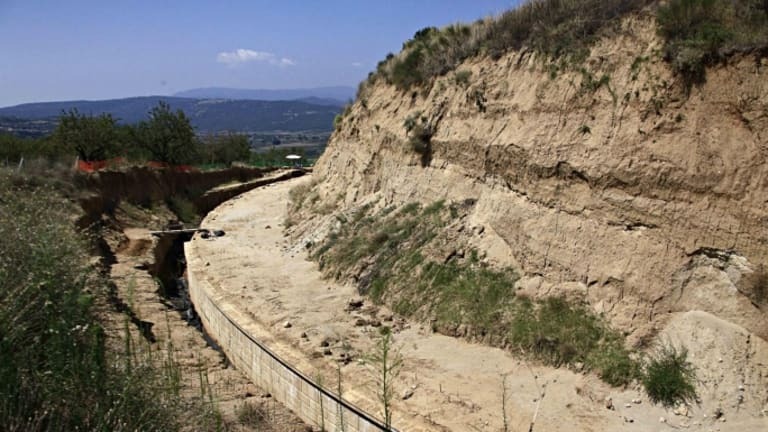 Some have speculated, however, that the Amphipolis tomb could have been originally constructed with the intention of holding Alexander’s body. A more likely explanation is that the grand tomb was built for one of Alexander’s commanders or family members. The empire forged by Alexander quickly crumbled into warring factions following his death, and blood drenched Macedonia’s arid hills from the infighting. Amphipolis, a former Athenian colony conquered by Philip II in 357 B.C., did not escape the violence. 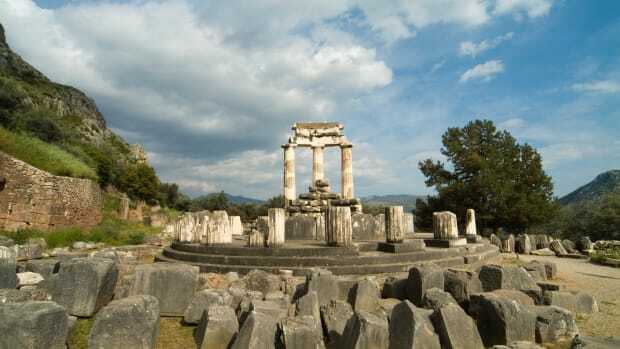 It was there that Alexander’s wife, Roxana, and his son and rightful heir to the throne, 12-year-old Alexander IV, were murdered by Macedonian general Cassander in 311 B.C. It’s possible that the tomb was built for either or both of them. Another theory is that the massive grave belonged to one of Alexander’s numerous generals and admirals who lived around Amphipolis. 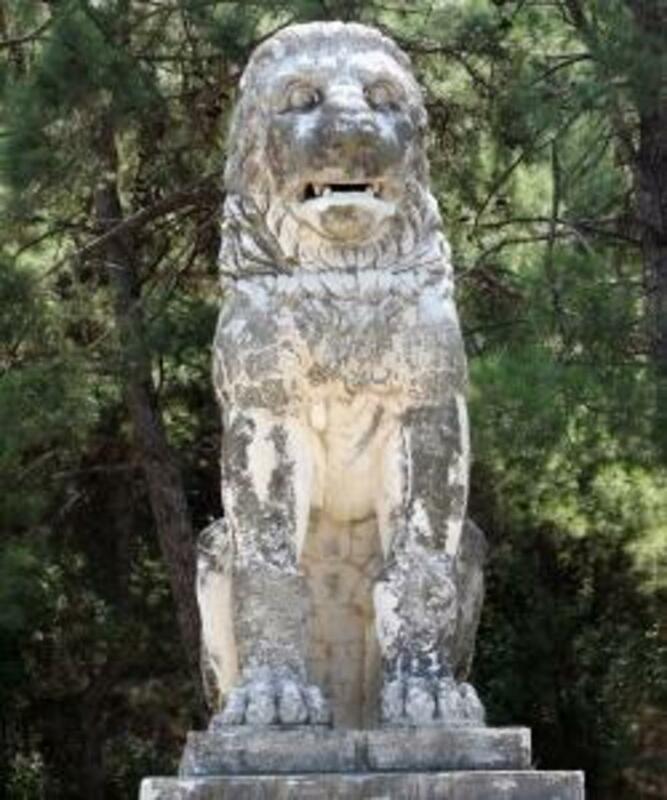 Lion monuments were often used to commemorate dead soldiers, and some have theorized that the Lion of Amphipolis once marked the grave of Laomedon of Mytilene, one of Alexander’s military commanders who governed Syria after the king’s death. “The excavation will continue at a pace dictated by the finding as well as the scientific ethics,” the Greek prime minister announced, but archaeologists are hopeful to enter the tomb by the end of August to determine exactly who is buried inside. The archaeological work continues under heavy police guard. “The land of Macedonia continues to move and surprise us, revealing its unique treasures, which combine to form the unique mosaic of Greek history of which all Greeks are very proud,” Samaras said. Archaeologists are hoping that the ancient ground of Macedonia holds at least one more surprise that will soon be revealed. Are Greece’s Ancient Treasures Under Threat? 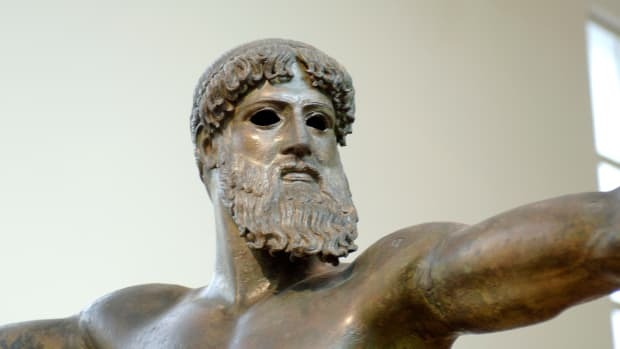 Was Skeleton Unearthed in Greece a Human Sacrifice to Zeus?